Heat oil in a frying pan over medium-high heat. Cook crumbs, stirring, until just turning golden. Add garlic and lemon zest. Cook asparagus and beans in a saucepan of boiling water, for 2 to 3 minutes or until bright green and just tender. Drain well. 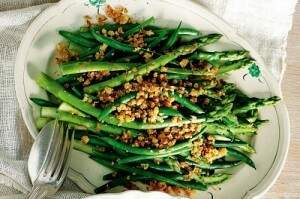 Place beans and asparagus on a serving plate. Season with salt and pepper. Drizzle with lemon juice and sprinkle with crumb mixture. Serve.